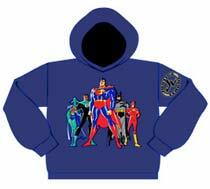 Embroidered "Justice League Standing" logo on navy blue hooded sweatshirt that is made of a 60/40 polyester/cotton blend. Inside of sweatshirt and sleeves is lined with cozy fleece. Hood is made from a double thickness of fabric. Official Justice League logo is embroidered on left sleeve. 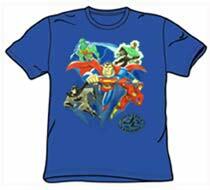 Youth sizes Medium (12-14) and Large (16-18)and XL (18-20). 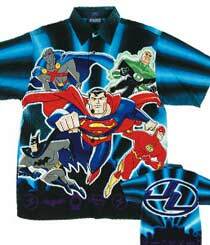 Justice League "Flying at You" image on a colorful button down "club shirt" made of washable 100% polyester. Only youth sizes Large left in stock.